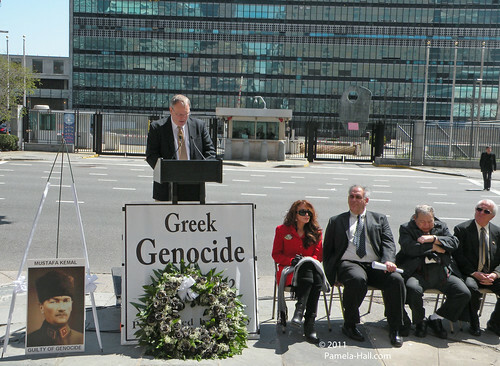 Vigilant Squirrel Brigade: 3rd Annual Greek Genocide Commemoration (video) outside U.N.
3rd Annual Greek Genocide Commemoration (video) outside U.N.
On April 6, 2011 (Black Easter), across from the United Nations in Ralph Bunche Park, Greek American Community Leaders, American Scholars, and American Activists assembled to remember the victims of the Greek, Armenian, and Assyrian Genocides perpetrated by Turkey from 1914 till 1923. 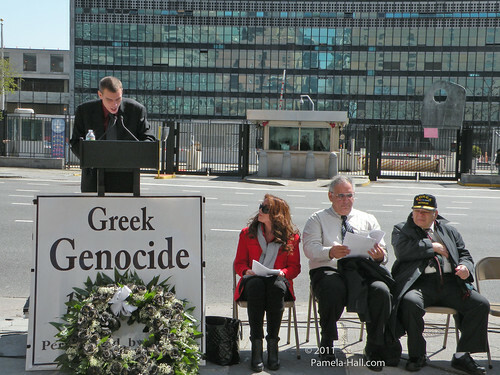 This year’s event, as always, was held on April 6th the Pan-Hellenic Memorial Day for the Genocide of Thracian Hellenism, which is in remembrance of Black Easter in 1914. 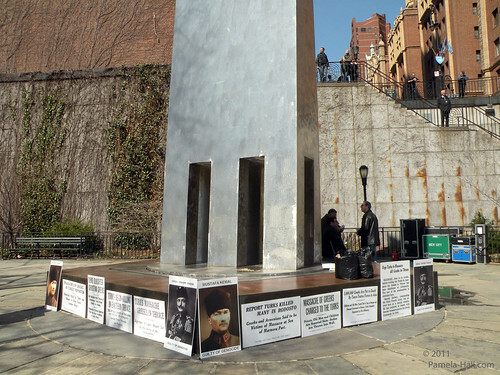 (VSB also covered this commemoration last year.) . "For the second year in a role the event was commenced by the reading of the ancient Orphic Hymn ‘Thanatos’ by Georgia Nomikos. This year’s Master of Ceremonies was past President of Panthracian Union of America ‘Orpheus’ Ioannis Fidanakis. Mr Fidanakis began the event by thanking those in attendance and acknowledging such notable attendees as Mr. Bill Theodosakis. 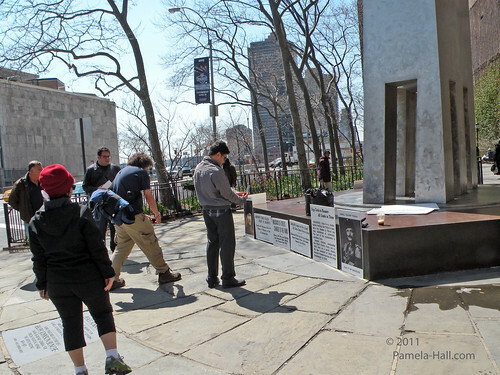 Mr. Theodosakis has been organizing a Greek Genocide Memorial at Three Hierarch’s Church in Brooklyn since the 90s. Dr. William Samonides, President of the Asia Minor Hellenic American Society. Professor Alex Hinton, First Vice-President of the International Association of Genocide Scholars. 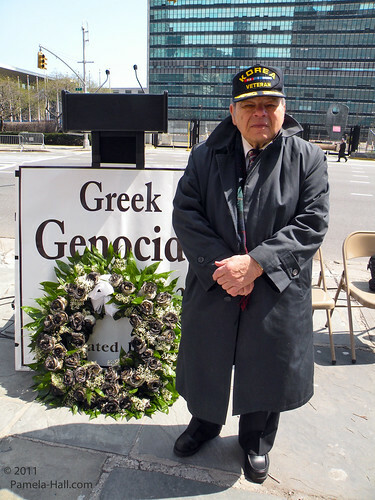 Elias Tsekerides, President of the Federation of Hellenic Societies of Greater New York. 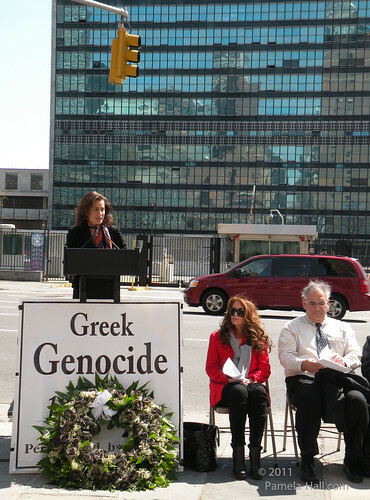 Ms. Geller’s public support for the recognition of the Greek, Armenian and Assyrian Genocides and her call for the Greek-American Community to wake up and raise awareness of its own Genocide raises the question, "Just what are the leading Greek American Advocacy Organizations, such as the American Hellenic Institute (AHI) doing about the issue?" The answer is sadly nothing. 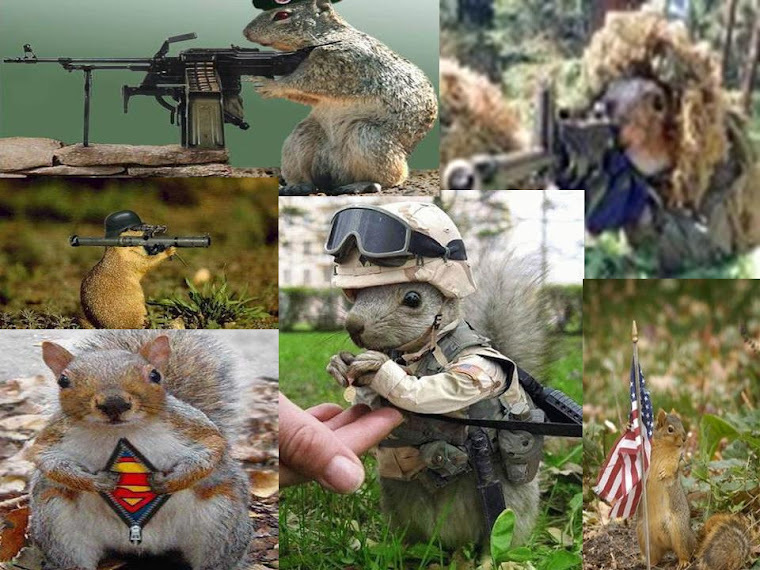 They are supposed to be advocating our National Issues in Washington D.C. 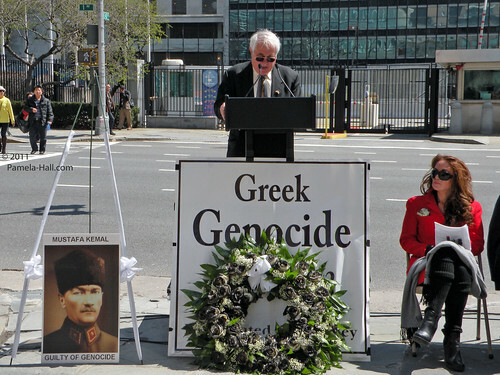 In fact not only is AHI not doing anything to raise awareness of the Greek Genocide or push for its recognition, their official position undermines the entire cause for recognition. 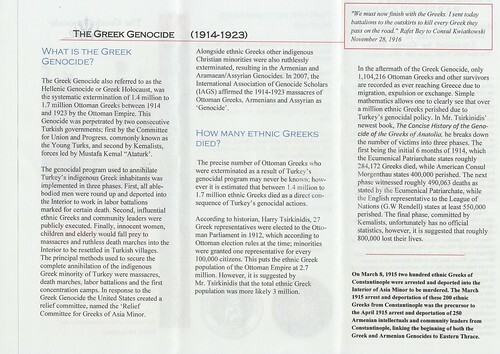 All one must do is simply check AHI’s Policy Statement to see that they still ignorantly support the idea of recognizing ONLY the ‘Greek Pontian Genocide’ and its ‘500,000’ Pontian and Anatolian Greek victims. 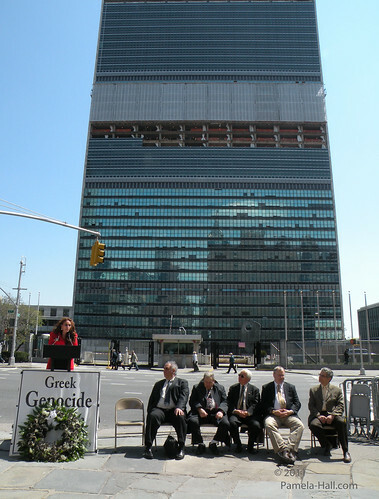 Rather than supporting our Genocide’s complete recognition and its scholarly recognized 1.4 to 1.7 million victims, their official position forgets the Thracian Greek victims and belittles the suffering of Asia Minor Greek victims. It is the obligation of organizations, like AHI, to break-free of petty regionalist agendas and support a policy that best represents historical truth and international justice. The illusion that has allowed Greek America to become indifferent to the Genocide of Thracian Hellenism must be destroyed. 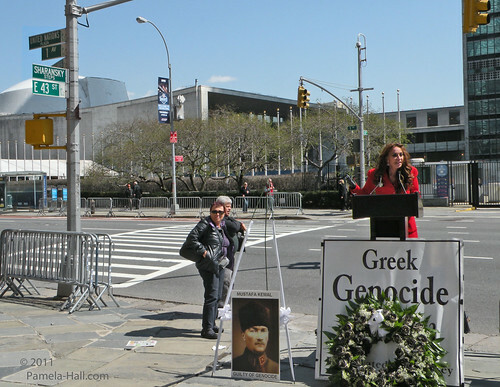 We must take heed to the words of Ms. Geller and educate ourselves and our neighbors if we are ever to see the Greek Genocide recognized. " 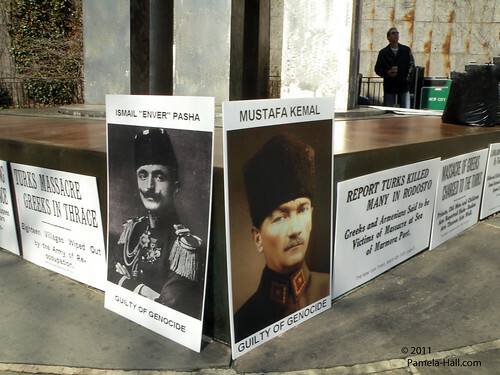 and enlarged photos of “Enver’ Pasha and Mustafa Kemal. 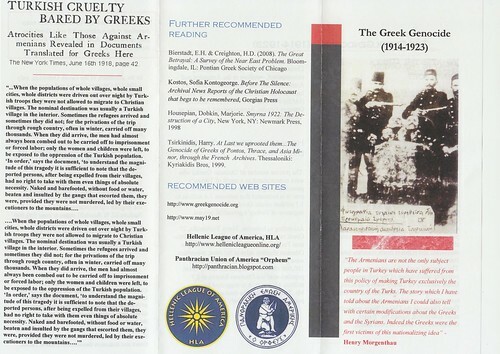 about the Greek Genocide produced by the Hellenic League of America, HLA. 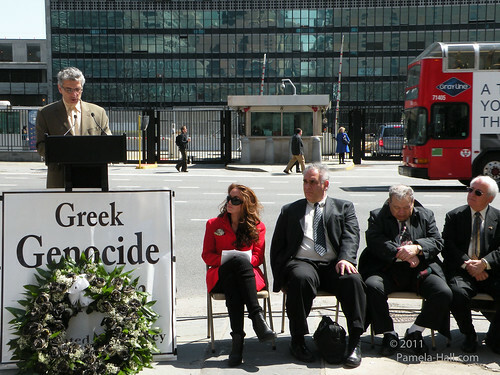 The commemoration was hosted by Panthracian Union of America 'Orpheus' and supported by the Hellenic League of America, HLA. 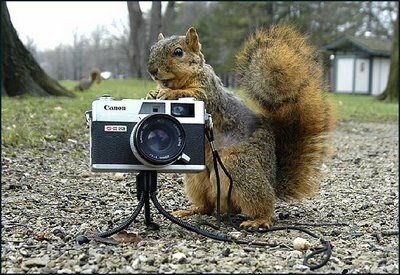 Next is the video coverage of the event. 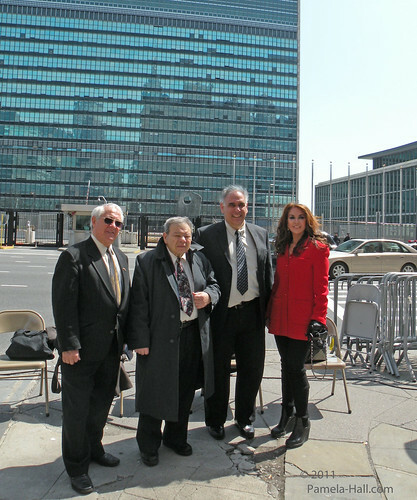 It was very windy outside the UN. The podium mics didn't have a wind-screen. There will be occasional distortion from the wind. It comes and goes. 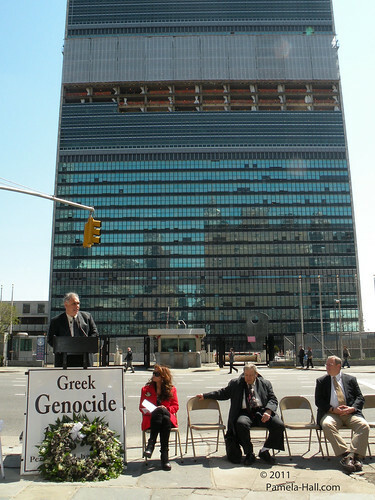 Part 1 Introductory comments of the commemoration by host, Ioannis Fidanakis. Part 2 Ioannis Fidanakis introduces the first of several speakers, Dr. William Samonides, President of the Asia Minor Hellenic American Society. Part 3 Ioannis Fidanakis introduces Professor Alex Hinton, First Vice-President of the International Association of Genocide Scholars. Part 4 Ioannis Fidanakis introduces Elias Tsekerides, President of the Federation of Hellenic Societies of Greater New York. The Hellenic League of America (HLA) is a cooperative and collective effort by Hellenes, Phil-Hellenes and Hellenic enthusiasts who come together for the Hellenic Cause. A register 501c nonprofit organization the Hellenic League of America, HLA works to spread awareness on Hellenic National Issues, as well as our ethnic traditions and culture. 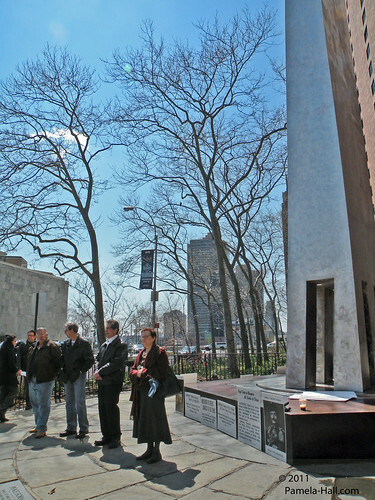 Founded in 2008 the HLA has been involved in organizing lectures, protests, rallies and commemoration across the tri-state area. Panthracian Union of America ‘Orpheus’ Inc., is a not-for-profit Philanthropic and Cultural Organization serving the Thracian American community since 1983.